“If we want to use the trails, we have to do our part,” said Carlos Martel, a leader in the CoTrails Initiative, a volunteer coalition that works with the United States Forest Service to manage and maintain trails in the Chattahoochee-Oconee National Forest (CONF). Funding for recreational trails is diminishing and opportunities to create new trails are disappearing. Our existing trails must serve more users and more uses. 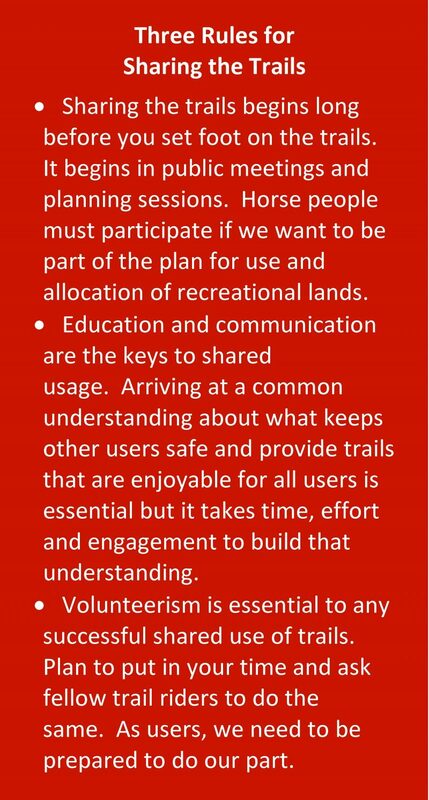 This means that trail riders must find ways to work with other users so that we can all enjoy a pleasant, safe experience on the trails. Martel, who also serves as president of the Back Country Horsemen of North Georgia Chapter, is expressing an idea we all must adopt to maintain our access to the trails that traverse our public lands. CoTrails, a coalition of equestrians, cyclists, hikers, motorized riders, conservationists, and other trail users of the CONF’s 866,468 acres, is setting the standard for what works for shared usage trails. CONF covers the northern and central tiers of Georgia, stretching from the border of South Carolina across to Alabama. About 2.2 million annual users visit its trails, rivers, lakes and wilderness areas. Around 850 miles of trails – including the Appalachian Trail – crisscross the region. 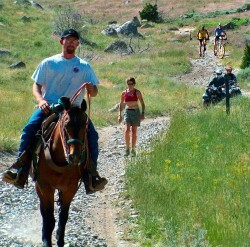 Most trails are multi-use and about 250 miles of the trails are open to horses and pack animals. In 2006, the Forest Service was prepared to restrict horses to designated trails with no access to cross county riding. Horse people realized they needed to organize if they wanted to maintain horse access. Local chapters of Back Country Horsemen of America (BCHA), a national organization promoting trail access and stewardship, swung into action. Back Country Horsemen reached out to other horse trail clubs across the state. They organized an extensive outreach and public relations effort to educate other users, the Forest Service, and the public at large about their commitment to supporting trails and the economic benefits of horse trails. There was ample evidence of this commitment: Trail riders put in thousands of hours of maintenance alongside other users. BCHA’s North Georgia chapter adopted a campground slated for closure by the Forest Service, providing all routine maintenance for the facility, from mowing to cleaning and trash pick-up. They also built horse corrals to complement the existing high lines for securing horses. In 2007, a new Forest Supervisor, George Bain, came to the CONF. Soon after his arrival he reached out to all recreational user groups. He quickly determined that the decision to limit horse access should be put on hold until it could be studied further and discussed. Bain’s review of the proposed horse restrictions led to a horse trails assessment in the Conasauga Ranger District of CONF. All users, not just equestrians, were encouraged to participate in the review. Opinions were actively sought and suggestions heard. The resulting assessment recommended expanded trail access for horses in several areas of the District. 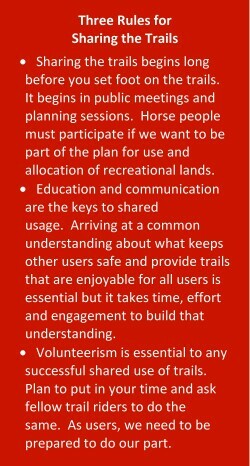 In 2010, Bain invited trail riders, hiking and cycling clubs and other user groups to help realize the recreational vision and goals of the CONF. Soon after, CoTrails was officially formed. The initiative was unveiled with a series of public input meetings around the state attended by more than 350 interested volunteers. CoTrails facilitated an honest, civil dialogue among user groups and with the Forest Service. Four common issues consistently arose at the public meetings: Resources (the condition of land and trails), education, volunteer coordination and engagement, and communications. By 2011, the group had more than 40 committed members and had fully developed an action plan for each area. After reviewing their scope of work, the group decided they needed a strategic plan and a small leadership team to oversee its development and implementation. The group came together to elect an equestrian, Carlos Martel, to chair the CoTrails working group. In January 2012, the CoTrails Strategic Plan was unveiled along in support of its mission to provide a diverse, quality trail experience that is maintainable and ecologically sustainable. More than 100 volunteers, representing a range of recreational trail users, spent the weekend at a conference center in a state park to give feedback on the strategy and participate in trail workshops presented by professional trail designers. Hikers, mountain bikers, motorized riders, horse people and conservationists gave input and found solutions together. Volunteer engagement and training remains strong. The plan hinges on volunteers and all users working alongside one another. Horses carry tools in and out, relieving volunteers on foot. This sweat equity creates mutual respect and a shared ownership of – and responsibility for – the trails. As a result of CoTrails, a professional assessment was completed on 250 miles of trails and volunteers were trained in evaluating trails and conducted volunteer evaluations on another 250 trail miles. The land managers now have a very good picture of the conditions on the majority of their trails. A digital interactive map of the trails is underway, unauthorized trails are being identified and new opportunities are being considered. Users of all types can propose new trails, connectors or reclassification of existing trails. Every proposal must be supported by a ten-year trail maintenance commitment by a volunteer group. The CoTrails model was recognized with a Volunteer Group Award presented by the Regional Forester for the USFS Southern Region and nationally by the USFS Chief as the “Forest Service 2012 Volunteer Trails Group of the Year.” Forest Supervisor George Bain was also named Forest Service Land Manager of the Year for 2012. To learn more about the CoTrails model, please visit www.cotrails.org. To learn more about Back Country Horsemen, visit www.backcountryhorse.org.